Over a span of 30 years, Naylor has brought together a team of landscapers and support staff who bring the best in landscape services to the Kalamazoo area. 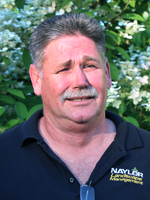 Barney Naylor is the Founder and President of Naylor Landscape Management, Inc. He started the business in 1982 while attending Western Michigan University. After earning a Bachelors Degree in biology, he decided to make the green industry a permanent career. Barney is a Michigan Licensed Pesticide Applicator and Certified Trainer and a Certified Green Industry Professional (CGIP). Barney is actively involved with the Homebuilders Association of Greater Kalamazoo, Kalamazoo Valley Chapter of Trout Unlimited and Southwest Michigan Landscape Association (SWMLA) & National Association of Landscape Professionals (NALP). He is an avid fly-fisherman and enjoys gardening, hiking, camping, biking, cooking and traveling. Barney lives in Kalamazoo with his wife, Judy. 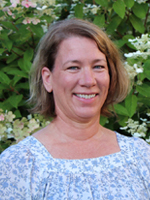 Judy Naylor has been with Naylor Landscape Management, Inc. since 1992. She has a Bachelors Degree in Interior Design from Western Michigan University. After working in the design field for several years, she decided to join Barney in the green industry. Judy’s responsibilities include bookkeeping, payroll, accounts payable and any other tasks that help the office run smoothly. She is actively involved with the Kalamazoo/Battle Creek Chapter of the National Association of Women in Construction (NAWIC) and the Kalamazoo Valley Chapter of Trout Unlimited (KVCTU). She loves just about any outdoor activity. Hiking, gardening, kayaking, camping, fly-fishing and biking are a few of her favorites. Dana Russell, our Director of First Impressions/Administrative Assistant and Accounts Receivable Clerk joined Naylor in March 2007. 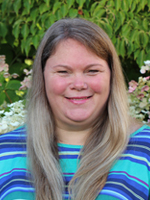 Dana has an Associates Degree from KVCC in Business Administration and worked as an administrative assistant for a large contracting company in Florida. Dana served in the U. S. Army specializing in Office Management as an Administrative Specialist in Fort Rucker, Alabama. Her years of experience in office administration has been a huge benefit. She has found new and better ways to run our office and interact with our clients. Dana has two boys. Mike joined our team in March 2010. He brings 18 years of experience and a passion for creating and maintaining beautiful outdoor spaces. Mike uses his past experience with landscape design, customer relations, labor management and maintenance leadership to develop excellent crews and premium service for all of our clients. He returned to his hometown of Kalamazoo after working for English Gardens and R&M Landscaping in the Detroit area for five years. In his spare time he enjoys camping and traveling with his wife and their children. He also owns an amazing vinyl record collection and when he isn’t rockin’ out, he can often be found tending to an impressive garden. 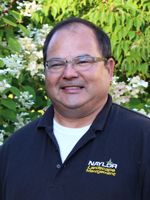 David Finn joined the Naylor Landscape family in March 2016 as the Landscape Installation Coordinator. He also manages the Christmas Décor installation team. After spending over two decades of running a successful property maintenance business, David sold his company in 2014 to get re-energized. 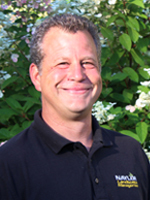 His passion around lawn and landscape maintenance brings a wealth of knowledge and expertise to our team. Outside of work, you’ll find David pursing one of his varied interests: music, nature, sports and entertainment. To contact any of our team members, call or send an email here.